This is a Pacific whaling song. Most whaling songs I know are Atlantic based, sailing to Iceland and Greenland whale fisheries. 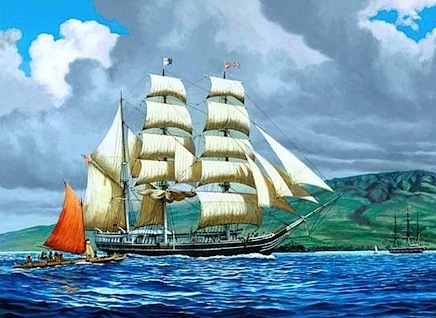 This is the story of a ship based in Maui that sailed to the Kamchatka_Peninsula where there were many types of whales in the 1800s. I would encourage you to listen to this with large speakers or earphones, as there some low frequencies that will surely be lost through computer sound systems. [Em] It’s a mighty tough [B7] life [Em] full of toil and [B7] strife? And we really don’t [B7] care when the [Em] gale is [B7] done? [Em] How hard them [D] winds did [Em] blow? [G] We’re homeward bound from the [D] Arctic Sound? And we’ll have our [B7] fun when we [Em] drink our [B7] rum? Once more we sail with a Northerly gale? Through the ice, and wind, and rain? Them coconut fronds, them tropical lands? ?Six brutal months have passed away? On the cold Kam-chat-ka sea? But now we’re bound from the Arctic ground? Once more we sail the Northerly gale? Going towards our Island home? Our mainmast sprung, our whaling done? We ain’t got far to roam? Our stuns’l booms is carried away? A living gale is after us? How soft the breeze through the island trees? Now the ice is far astern? Them native maids, them tropical glades? Even now their big, round eyes look out? Hoping some fine thing to see? Our baggy sails running ‘fore the gales?